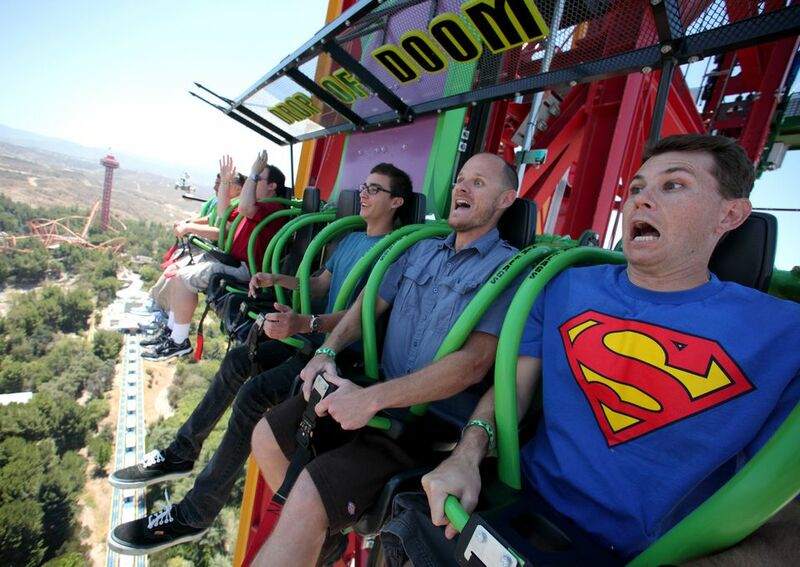 Superman's bald nemesis, Lex Luthor, offers some uber-hairy thrills at Six Flags Magic Mountain. And like a potent piece of kryptonite, he has placed his diabolical contraption where it can do the most damage: right next to his arch rival's Fortress of Solitude. Using the tower of the Superman: Escape from Krypton shuttle coaster -- the 400-foot tower I might add -- the Lex Luthor: Drop of Doom takes thrills to literally and figuratively unheard of levels and reduces all but the most super of men (and women and children) to whimpering puddles of mush. OK then! Who is ready to ride? The sheer audacity of the Drop of Doom is astounding. The ride features two eight-seat platforms that slowly -- we're talking about an agonizingly slow pace -- lift to almost the tippity top of the 415-foot tower that supports the park's Superman coaster. That gives Magic Mountain bragging rights for one of the world's tallest drop rides. Rider's legs dangle with nothing beneath them. There isn't anything above them. And the two riders at either end of the platform have nothing to one side of them. For a few breathless seconds, with their feet nervously swinging in the air, riders hang there to contemplate the drop that's about to take place. Then, yeeeeeeahhhhhhh! Riders freefall and accelerate to 85 mph for what is surely among the most intense five seconds they will ever experience. Magnetic brakes kick in to slow the vehicles as they approach the bottom. Passengers have to provide their own sedatives. While the tower ride offers a similar drop to the adjacent Superman: Escape from Krypton coaster, the experience is quite different. The coaster blasts off backwards, reaching a speed of about 100 mph as it races up the tower -- as opposed to the s-l-o-w ascent of Lex Luthor: Drop of Doom. The coaster then hangs for a few seconds, and releases to race back to the station. Because the coaster's station is above ground level, and the cars don't blast completely up to the top of the track, the drop for Superman is listed at 328 feet. The Drop of Doom, however, climbs to the 400-foot level of the tower and plummets straight to the ground. Unlike the coaster, which provides riders with the snug comfort of a coaster car that has sides and a floor, the drop ride leaves riders feeling alarmingly exposed in what is essentially seats welded to the front of the platform. This is actually the second drop tower ride to piggyback onto a shuttle coaster. The 377-foot-tall Tower of Terror in Australia (not to be confused with the comparatively puny Tower of Terror rides at the Disney parks) has The Giant Drop attached to its tower. It's a mere few feet smaller than its California counterpart and has been scaring Aussie blokes silly since 1998. In 2014, Six Flags Great Adventure in Jackson, New Jersey opened its own mega drop tower ride, Zumanjaro: Drop of Doom. It uses the tower of the exceptionally tall coaster, Kingda Ka. The New Jersey tower ride is essentially similar to Lex Luthor. But at a height of 415 feet and a speed of 90 mph, it beats the Magic Mountain ride, even if just slightly, in the thrills department. So, could you handle Lex Luthor? Only you could answer that. But if you could, you will have tackled one of the world's most thrilling rides.